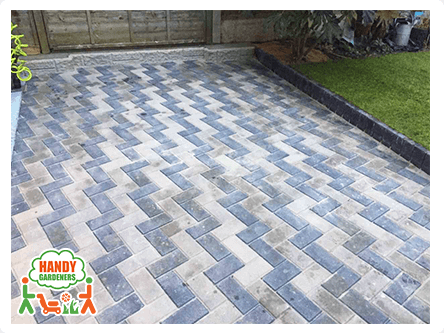 As professional landscapers we not only work in small scale gardens or take on simple re-turfing projects, but also enjoy landscaping big open spaces and turning them into fabulous gardens. Sometimes the larger the area to work with, the greater the possibilities and options are for successful transformation of the outdoor space. The more complex the requirements of our clients are, the more satisfying the outcome is, as you can see illustrated with the amazing garden transformation we’ve just completed in Stoke Newington. Step 1. The viewing. From the very beginning of the communication between the client and our office, we knew that the landscaping project would be a complex and multi-componential one. Normally, we’ve first arranged for a meeting between the family and our most experienced landscapers. Measurements had been taken of all the areas that required work and the plan of the landscaping job had been mapped out. Step 2. Outdoor space planning. The largest portion of the garden was meant to be covered with freshly installed turf. After that the area for the new patio was determined along with drafting the lay of the pathway. By planning everything in advance, we made sure that the designed outdoor space would be perfect for both play time on the green grass or sitting outside on the new patio. The railway sleepers created from reclaimed wood, would welcome to the garden colorful flowers or shrubs. Step 3. Preparation work. 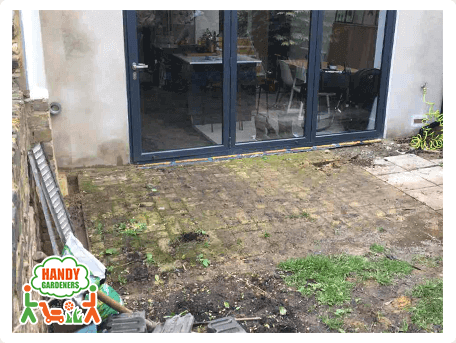 Preparation for the execution of that landscaping job took longer period of time than expected due to its many and different components that it involved as opposed to the straight forward re-turfing. 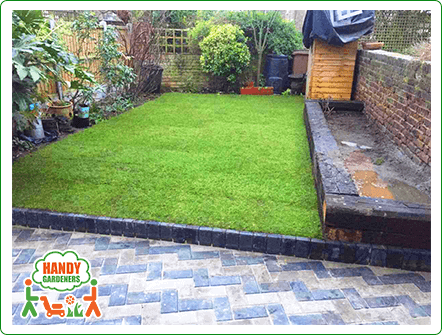 We needed to obtain particular materials as requested by our clients, as they wanted recycled wooden materials for the railway sleepers, patterned slabs for the patio and of course, the best quality of natural grass that we were happy to install for them. Step 4. 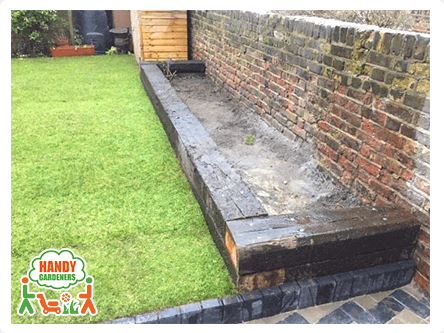 Garden clearance and drainage system installation. On the day when the landscape appointment was scheduled, we started with clearing thoroughly all the existing terrain. All the excessive greenery such as shrubs, weeds and trees were removed so the earth could be leveled nicely and evenly. While leveling the ground, our landscapers prepared the designated area for the drainage by digging a ditch along the patio edge and gravel was added to it, so the drainage tiles and pipe could be installed atop proper fabric lining. 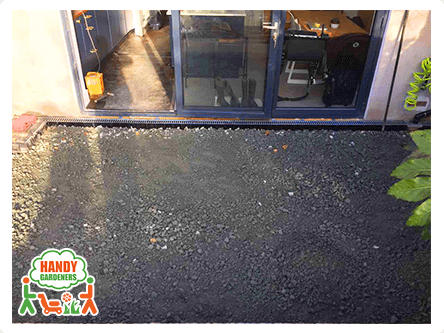 Gravel was added in order to cover the tiles completely and the drainage cover was installed. 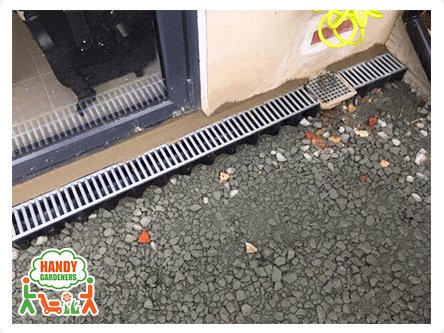 Good channel drainage system is important to ensure that any English garden stays dry and mold free. Step 5: Patio and front path laying. The next step in transforming the garden in N16, Stoke Newington was to lay 20 m2 of patio and 10 m2 front path. 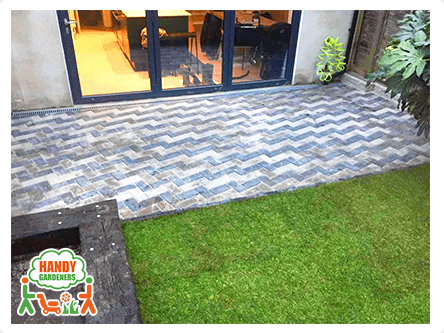 The laying of the patio and the path required the use of slabs and as per the request of our clients, we laid them with using special type of patterned slabs. 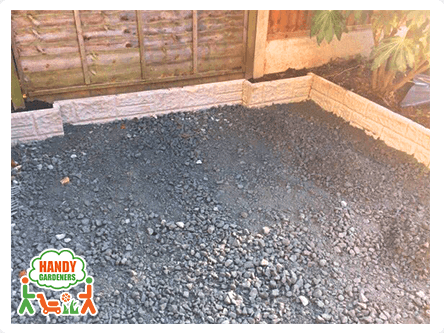 To put everything together, we used also a 50 kg bag of sand in combination with a jumbo bag of M.O.T base, two bags of gravel and grouting compound. The patio was fitted and so was the front pathway, so it was time to build the railway sleepers. Step 6. 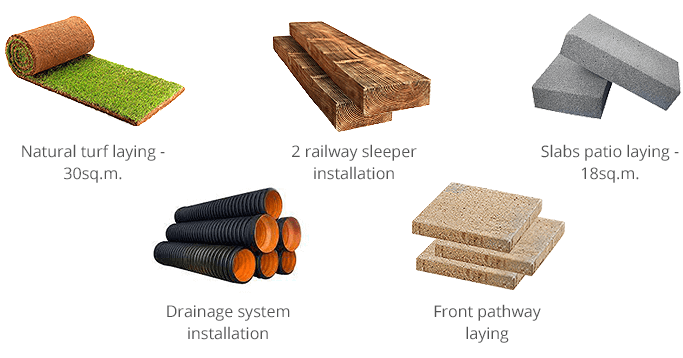 Railway sleeper installation. 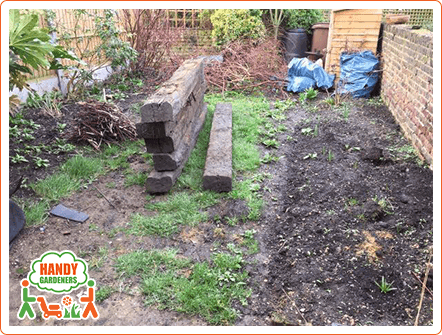 Having all the measures taken on the viewing day and following our clients’ instructions, we had prepared wooden railway sleepers of reclaimed wood, each of them long 10 metres and few smaller pieces for the building of a small wall around the patio. Our clients were very specific in their request for using reclaimed wood and that made our gardening team very happy using recycled products is not only environmentally friendly, but also it is dry and well-seasoned wood that by default would be durable and stable. Still, finding the perfect wooden materials involves much more than a simple visit to the local lumberyard. Step 7. Turfing. The final assembly of the project had already been started, so it was the time for re-turfing – the step that would connect all the parts of this multi-componential landscape project together. Having prepared all the required materials in advance, we had 35 rolls of sod and 3 bags of topsoil, as well as a bag of compost for completion of the turf laying service. 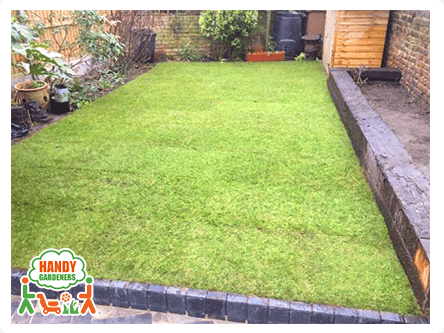 The grass was laid and fitted and so a brand new garden emerged before the eyes of our happy clients in Stoke Newington. Our handy team of London gardeners took three days to turn this ordinary and neglected British garden in N16 into a designer garden that stands out among the many standard gardens in our city.